If you have not read the first part of our blog, we highly recommend reading it as it covers blacks and contrast levels. Read it here. 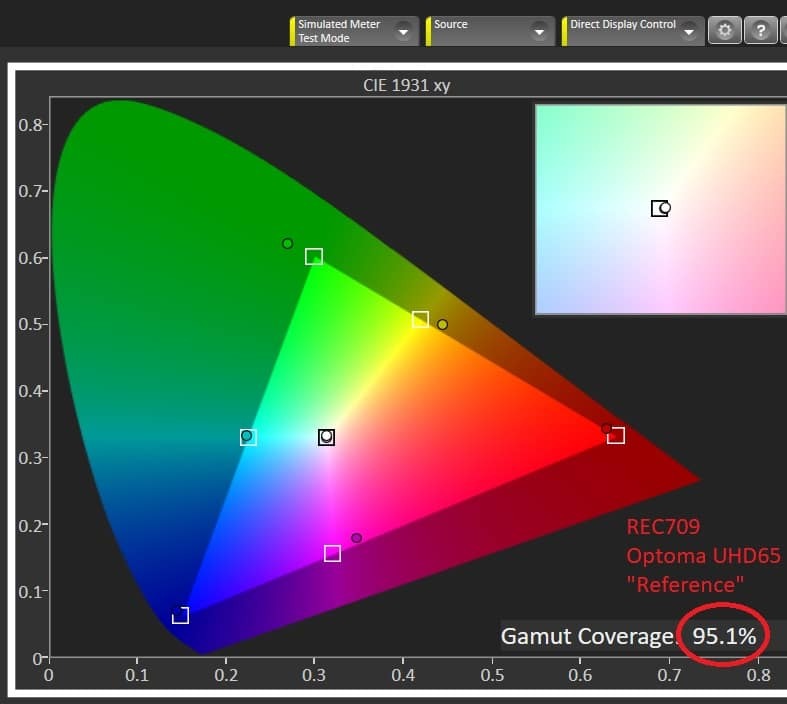 Comparing color between projectors online is very difficult due to the fact that most people will not see the images on a full REC709-capable calibrated monitor or even better, a P3-capable calibrated monitor. Then, add in the fact that even if two projectors have been calibrated to full ISF standards, when the camera records the image, the color wheel timing and shutter speed cannot record images that really represent what the eye sees in person. 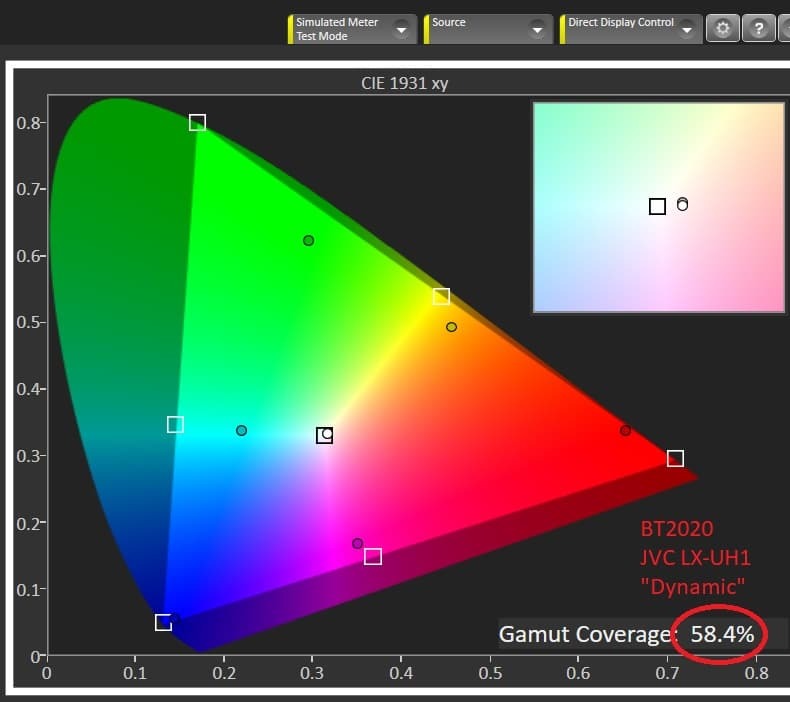 However, what we can measure and compare is the color gamut capability and how close the 4K HDR projector is approaching the REC2020 standard for expanded color in 4K HDR content. 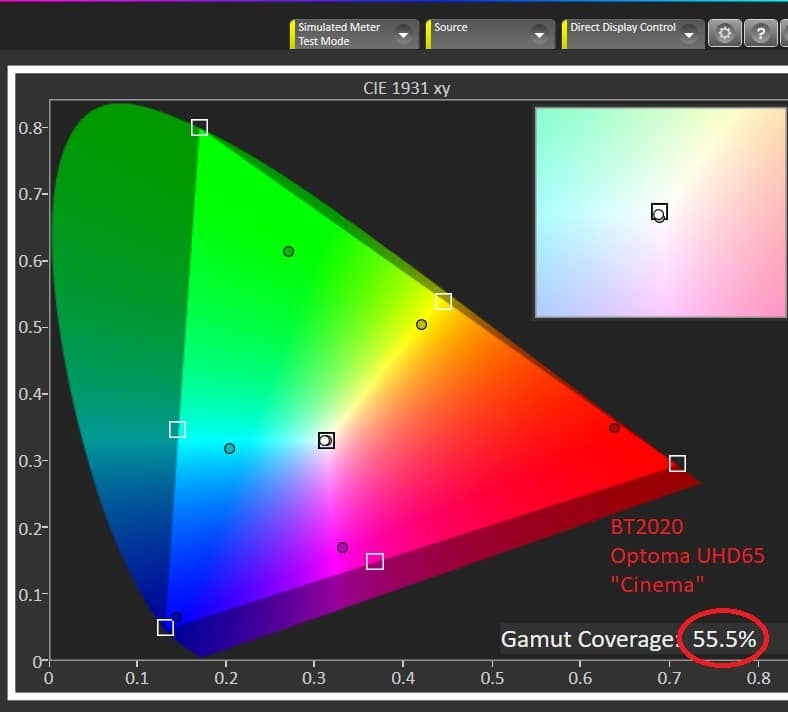 Wide color gamut and good brightness are on opposite ends of the performance scale for projectors. 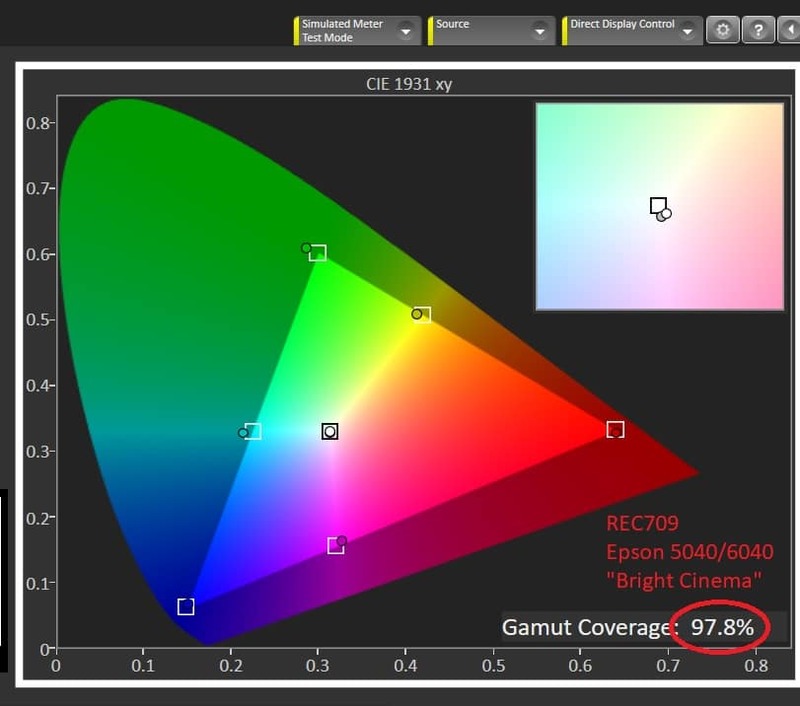 As color accuracy goes up, and colors are more saturated and deep, the brightness goes down. For example, the Epson is far and away the brightest projector in this group, and yet it is also brought down to at or below the light output of the JVC and Optoma when it is put in the Digital Cinema or Cinema Mode. Why? Lamp-based projectors can increase their light output by increasing the amount of green and yellow light in the image (the lamps have some of its highest light output in those regions). When a projector is put in its best color mode (usually Reference) the green and yellow light is diminished to get better balanced color and hit the target of D65 which sacrifices a lot of light in the process. Hence, when a calibration is done on a projector, care must be taken to not decrease the light output to the point the image is too dim to be enjoyed. We usually do what we call a balanced calibration which puts the white point at D65 and the primaries within a few degrees of targets without sacrificing too much light output. In other words, we feel it is more important to have a well balanced projector relative to color and brightness than to have a “dead on” calibration which reduces the light output to less than is really needed to get good quality images. Usually right after the setting of “Reference” color mode there is a setting called “Cinema,” which is usually a little brighter and yet can still create very good realistic color. We used the “Cinema” mode to do all of our comparisons except the max brightness mode which we noted in both the video and here in this blog. Each projector can display very good REC709 color as can be seen in this image of “Tartan Bars” from the Spears and Munsil HD Benchmark 2nd Edition. If your display you are viewing this with has very good color capability you may see the slight advantage the Epson has in terms of rich deep color. All three projectors can achieve 100%, or very close to REC709 color, for HD Blu-ray and HD content. Notice how close the center D65 white point is after calibration. In reference mode, and optimized for brightness, settings gave the UHD65 a reading of 95.1% of REC709 color. Here, the JVC LX-UH1 reading gave a similar but slightly better color measurement than the UHD65. 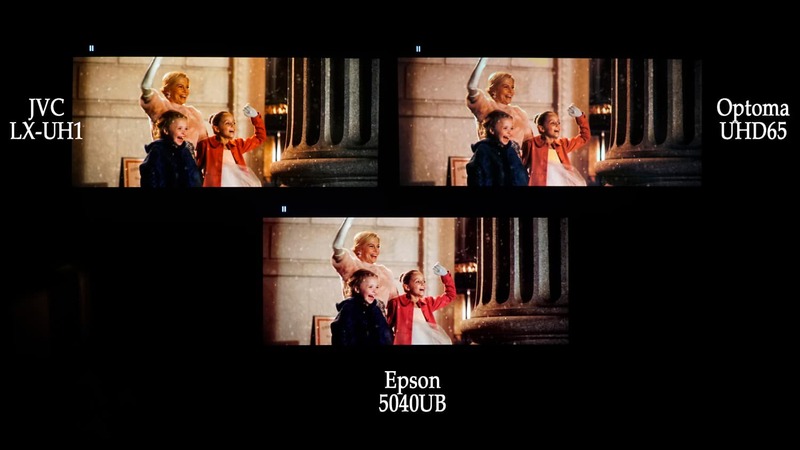 The Epson, even in its “Bright Cinema” mode was on par with the JVC and Optoma color gamuts. 4K HDR color capability was a slightly different story. On the one hand, wide color gamut approaching P3 and beyond is very exciting and fun to watch, however it really depends on how much brightness is also available as to how most people will react to it. HDR is all about a much wider range of what was captured on the original film in terms of both blacks and highlights and everything in between. It is what most serious photographers and cinematographers have been trying to achieve for many, many years. Now, with the advent of 10-bit 4K HDR discs, it is possible, for the first time, to actually see what their vision and creativity has achieved. Some feel that consumer grade OLED is the end-all\beat-all answer to 4K HDR display capability. I would disagree. While its true that a good OLED flat panel has good blacks, it is also true that they are very shiny and have a tendency to conceal low level detail. They are also somewhat limited in terms of peak highlights with the light output and color detail in those highlights. I actually prefer a good 4K HDR projected image in a theater-like environment to a good flat panel. The human eye actually changes in a dark room and produces a chemical (Rhodopsin) which can increase the sensitivity by as much as 30 stops. We are able to see low level details and highlights which can actually seem brighter than a flat panel in a well lit room. Combine that with the much more involving and captivating image of a large projection screen with no glare or shine to get in the way and you have the makings of a great viewing experience. On a projector with good light output and HDR, the experience can be very satisfying and exciting. On some colors, like deep green, blue and deep yellow, the UHD65 is slightly higher than the REC709 standard. The JVC LX-UH1 was similar to the UHD65 but was not quite as deep in the greens and yellows but overall did slightly better due to its reds and blues. In this 4K HDR scene from “The Greatest Showman” you can see how close the JVC and Optoma are and the slight differences in color of the Epson. All three did a great job of color on most scenes. Here is where we really begin to see some significant differences between the projectors. Many online reviews have suggested that because the sharpness and image enhancement circuits are so good that at typical viewing distance you may not be able to see the difference. I strongly disagree with those statements – if you consider that “typical” viewing distance for 4K should ideally be between 1.5 and 2 times the screen height. If you look at native or true 4K material (not just up-converted as some 4K movies are) the differences are stunning even to the casual viewer if you ask them to select which one has more detail and sharpness. One of the reasons for the confusion is that some so-called “4K HDR movies” are really mastered in 2K and even though they are better than HD, because of the high quality up-conversion and extra color and dynamic range, they are not the movies or content where you will see the real differences. Here are some examples of true 4K content on all 3 projectors. For these comparisons each projector was optimized for its maximum sharpness without excessive ringing or harsh white edges. Additionally, all related adjustments including Super Resolution and Ultra Detail were also optimized. Focus was triple checked for maximum detail and sharpness. The differences we saw were very apparent at viewing distances up to about 2.5 times the screen height, after that, the differences became more difficult to see. Unfortunately, the stills had to be shot at a very slow shutter speed, to avoid the color effects of the two color wheels with the shutter speed, so they are not as sharp as we would have liked to have seen. Even so you should be able to see the differences. At distances further back than what is recommended for 4K content (1.5 to 2 X the screen height) the detail and resolution differences become very small and all three projectors make great images. 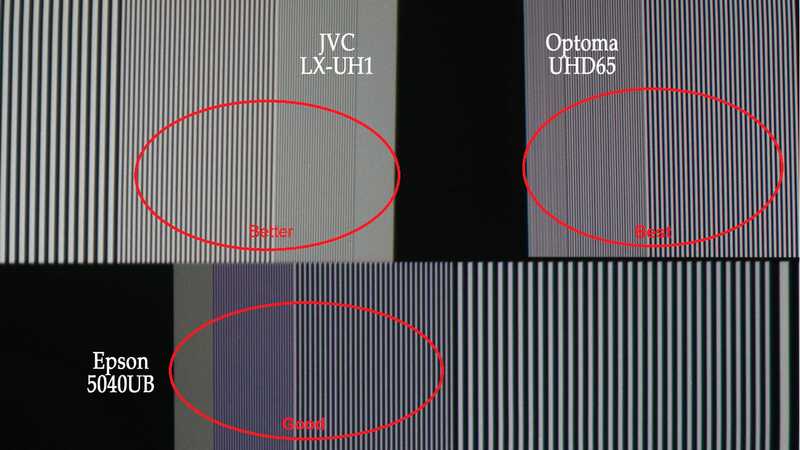 As can be seen in the closeups below, again not as clear as what can be seen in person to the eye, the .47″ DLP in the JVC is not quite as good as the .66″ DLP in the Optoma when it comes to resolving 4K detail. 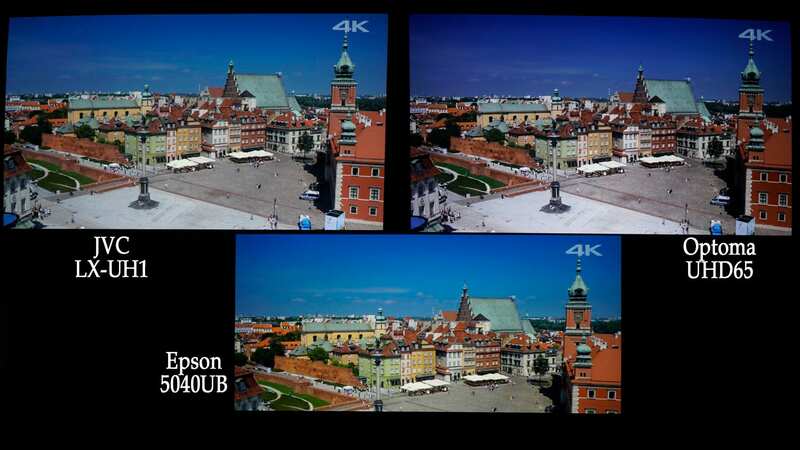 The Epson is slightly less detailed because of its ” 4K enhancement” – which is really putting about 1/2 as many pixels on the screen than the JVC and “>Optoma. 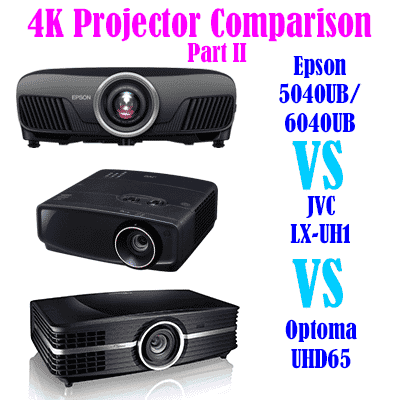 Nevertheless, the < href="https://www.tvspecialists.com/product/HomeCinema5040UB/">Epson is very sharp and clear and only on very good detailed 4K scenes can the differences be seen. It can come very close to the JVC but cannot equal the fine detail of the Optoma. 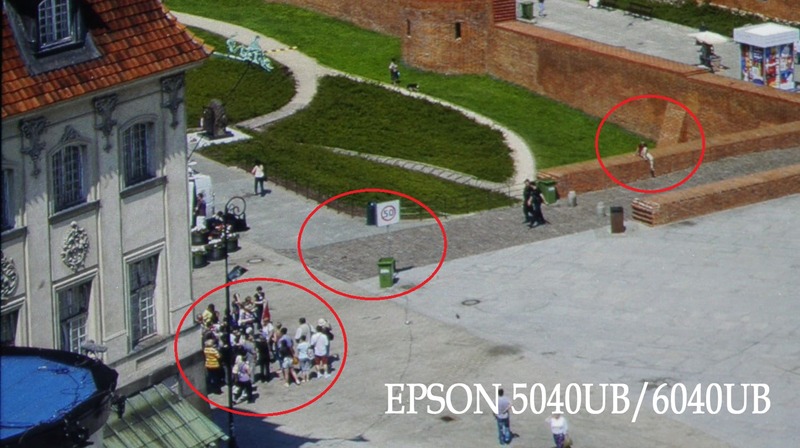 Good- If you look closely at the areas in the red circles of the Epson 5040UB / 6040UB above and compare those (after clicking and seeing the image at full size) to the JVC and Optoma images below, you should be able to see the differences. Note: The Epson image above was reversed and flipped to get this image to make comparisons easier. 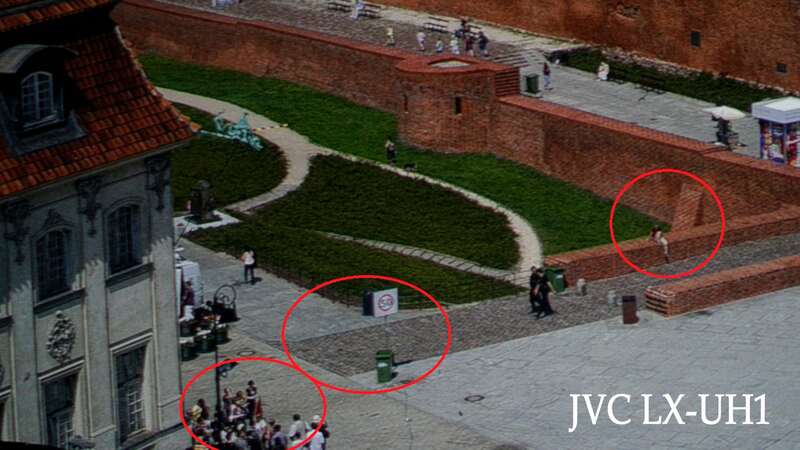 Better- Here the JVC shows slightly more actual detail in the bricks, pavement and people. Note: the JVC image was reversed to make comparisons easier. Best- When it comes to detail, the larger and higher-resolution DLP chip is the clear winner – when it comes to on-screen detail that is visible at 4K viewing distances. Notice the fine detail in the brick, the texture in the pavers, the garbage can, and the the people. The detail is very apparent when compared to the other two projectors. Since we could see very distinct differences between the three projectors on 4K content we decided to see if these same differences could be seen in a 4K multiburst signal from a test generator. Multiburst is used by engineers to test the frequency response of a display or signal path. It is a series of black and white stripes that get thinner and thinner until they reach the highest detail or frequency of the signal. The results of the test can be seen below. All three multiburst results are shown in this closeup of the highest details in 4K signals.Only the Optoma is able to resolve detail in even the highest and smallest burst. The blacker the blacks and the whiter the whites determine what the viewer will be be able to see in terms of fine detail and resolution. The whites or light grays of the second to last burst on the Epson above are dark and lose definition due to the dark almost-purple cast to the very fine detail. All detail is lost on both the Epson and JVC on the last and finest detail burst above. When it comes to displaying the fine detail and resolution of 4K content, the Optoma UHD65 is the clear winner out of these three projectors – both visually and measurement-wise. 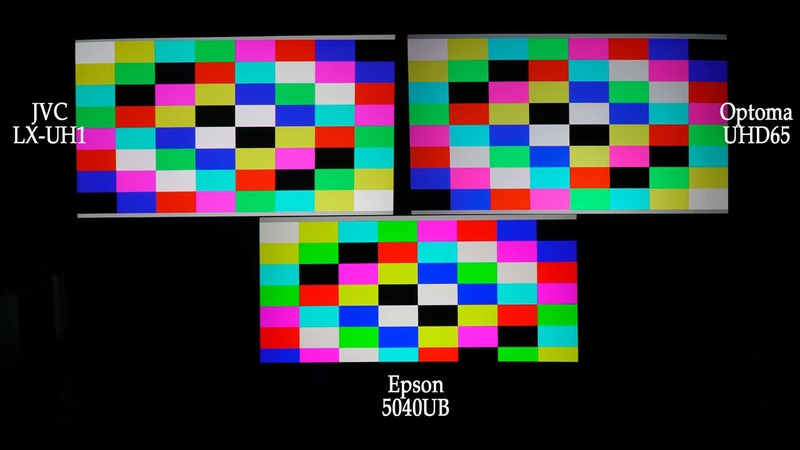 We expected the differences with the Epson 5040UB and 6040UB as they are using the “4K Enhancement” to which Epson explains they are achieving 4 million pixels on the screen. 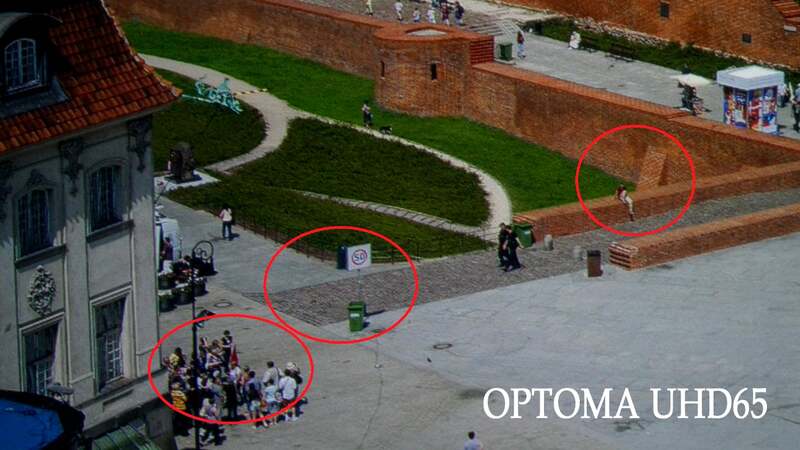 What we did not expect was the clear difference between the JVC and the Optoma. Theoretically they are both delivering 8 million pixels to the screen but clearly the larger .66″ DLP chip in the Optoma does a measurable better job than the .47″ DLP in the JVC. This entry was posted in AV Solutions, Home Theater and tagged 4k, 4K Projector Comparison, 4K Projector review, 5040UB, 6040ub, BT2020, color gamut, epson 5040ub, epson 6040ub, epson home cinema, home cinema 5040ub, home cinema 6040ub, jvc lx-uh1, lx-uh1, Optoma UHD65, projector comparison, REC790, UHD65.